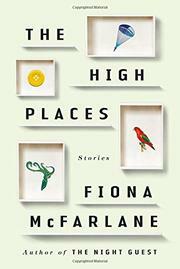 In her debut short story collection, McFarlane (The Night Guest, 2013) limns the hidden spaces of relationships. It's impossible to say, at the onset of any of these stories, how grounded they will stay in the familiar. Some are entirely realistic. "The Mycenae" follows a humble Australian couple on vacation in Greece with their patrician American friends and plumbs the emotional disconnect. "Cara Mia" employs an even lighter touch to glimpse the inner life of a young Australian teen with a subtly complex family life. "Those Americans Falling from the Sky" has a similar flavor, but its wartime setting and the fate of some stationed American soldiers tinge it with mortality. Death has a larger presence in "Exotic Animal Medicine," which traces an unconventional wedding day in England; "Man and Bird" incorporates death as well as the sublime. Several of the stories levitate into surreal planes with very different moods. "Buttony" reads like sci-fi horror, while "Violet, Violet" is playful in its exploration of loneliness and the question of an uncanny bird. "The Movie People" does the same for connection and escapism—townspeople involved in a local film shoot refuse to let the magic go—and is quite funny. The title story is brutal and biblical. "Unnecessary Gifts" is a bit of an outlier, an exercise in suspense that teases readers’ expectations. Yet all these feats are pulled off while never technically escaping reality. McFarlane writes with a deceptively plain hand, and her style gives shape to the unanswered questions of how well we can ever know each other or ourselves. What she leaves out is more telling than what she describes. It's hard to feel warmth from these stories; passions are mitigated or tamped down. But the writing is clever and skillful in spades.